DESCRIPTION OF THE BOOK: Leonora Logroño’s family owns the most beloved bakery in Rose Hill, Texas, spending their days conjuring delicious cookies and cakes for any occasion. And no occasion is more important than the annual Dia de los Muertos festival. MY TWO CENTS: While we’ve had a strong list of Latinx YA fantasy and magical realism books building for some time, most middle grade books by Latinx authors tend to fall into the genres of realistic fiction or historical fiction. So I was absolutely delighted to read this series opener by Anna Meriano which gives a traditional literary fantasy arc a Latinx, and specifically Mexican-American, voice. Meriano riffs on so many tropes here, including the family with a secret, the youngest child who is desperate to be included, and the sorcerer’s (here, bruja’s) apprentice whose attempts at magic go awry. 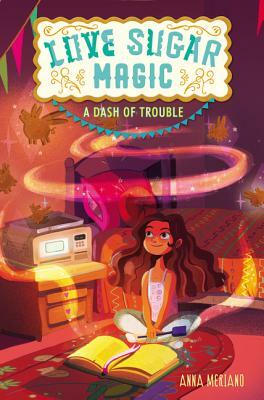 One of my favorite things about this book is how the author creates a protagonist who doesn’t speak Spanish (her abuela, who looked after her older sisters and taught them Spanish, died when she was little) and uses it as an obstacle that drives the plot. Magic spells are written in Spanish, so it makes sense that Leo struggles with following them—but also that she perseveres and sees them as her birthright. Not all Latinx kids in the US speak Spanish, for a variety of reasons, and I loved seeing that incorporated into the narrative. The family relationships in this book are just outstanding. Each sister is individual, and the conflicts between them feel real and lived. I would read an entire book about Marisol and her journey. Meriano doesn’t take the easy way out by having the parents absent or conveniently clueless for most of the narrative, instead making Leo sneak around, constantly worried that her magical efforts will be found out. Of course she is wrong, and the consequences are my favorite part of the book. Leo has to work to fix her mistakes. There is no waving a wand or finding the right words or having a mentor pick up the pieces. She has help, (some of it from an…interesting…source) but she has to do the heavy lifting and figure out the steps to reverse the effects of her spells. Magic systems are tricky to write, and I appreciate that Meriano has created a world with clear rules and expectations, even if they can be bent or broken occasionally. I would go so far as to say this book is a textbook example of a story that includes specific cultural details, holidays, and language without having them be the focus of the book. So much pop culture centered around Latinx characters uses the Day of the Dead celebrations as an entry and there’s nothing wrong with that, but it gets old after awhile. I loved how Meriano uses the Day of the Dead festival as a set piece, (it’s nice to see how the Logroño family aren’t outsiders in their town), but the book itself isn’t about Day of the Dead. Being a bruja has nothing to do with Day of the Dead. Being Mexican-American is about more than Day of the Dead, a fact that some in the media have yet to grasp. My favorite line in this book is what Mamá tells Leo when she asks what it means to be a witch. I’m so thrilled that young kids, just hitting middle school, struggling with their identity, will have Leo and her family to make them laugh and guide them to a better understanding of who they are who they want to be in the world. TEACHING TIPS: There is so much to unpack here for a literature circle or book group at a school. Leo makes lots of choices, which have consequences for many different people, so students can have a field day debating what she should or shouldn’t have done at many different points in the story. Spanish classes, start translating some of those spells! Students could test some of the recipes in the back of the book and bring in their efforts to share with classmates (there is even a gluten-free option). The fantasy elements of the book provide a means for students to write personal narratives imagining themselves into that world: what magical power would you like to have? What are the pros and cons of Isabel’s power versus Alma and Belén’s? ABOUT THE AUTHOR: Anna Meriano grew up in Houston with an older brother and a younger brother, but (tragically) no sisters. She graduated from Rice University with a degree in English and earned her MFA in creative writing with an emphasis on writing for children from the New School in New York. She has taught creative writing and high school English and works as a writing tutor. Anna likes reading, knitting, playing full-contact quidditch, and singing along to songs in English, Spanish, and ASL. Anna still lives in Houston with her dog, Cisco. Her favorite baked goods are the kind that don’t fly away before you eat them. This sounds like a super cute and lovely book! Thanks for the review!